For all Hebrew school teachers, creative moms and nurturing Bubbies, here is a fun way to make the Seder plate a candy dessert for children. The base of this Seder plate was really easy. We used the premade dark chocolate Seder Plate. 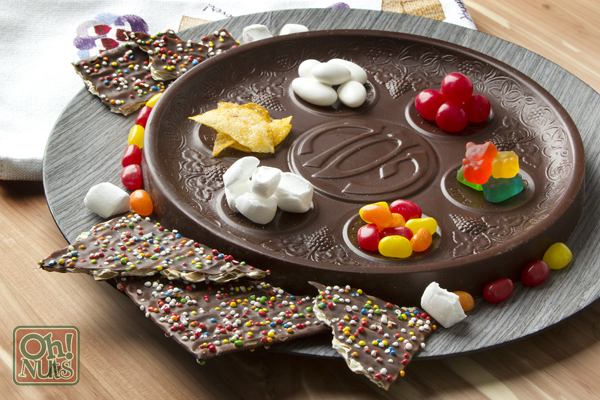 This highly detailed large Kosher for Passover Dark Chocolate Plate resembles a Seder Plate. The Seder Plate has alway been a focal point of the Seder. It contains six (6) symbolic foods relating to the miracle of Passover. 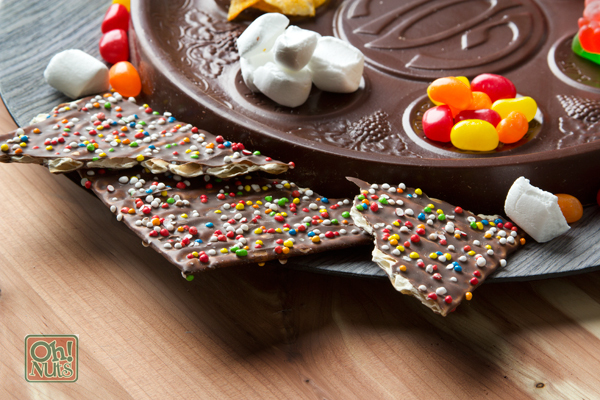 Chocolate covered Matza is also used for this display, because you can not have a Seder plate without any Matza! Alternately, if you’d like this Seder Plate Candy Display to be just the “icing on the top” of whatever cake you might be using for Seder night dessert, you can use this cake as your base on top of which you will assemble your Seder plate symbolic treats. If using the cake as your base, I would suggest putting little thumbprint cookies in each spot you will place your Seder plate commemorative item to serve as a “coaster” to these items. 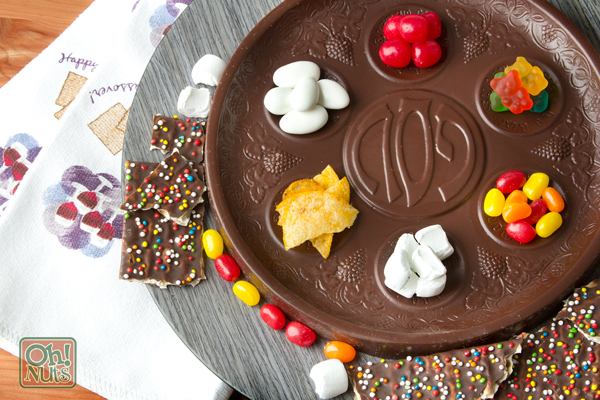 There are six items placed on the traditional Seder plate, and here is how we creatively found a candy item to signify each one. The next item is Baytzah, the roasted egg that reminds us of the Temple offerings. 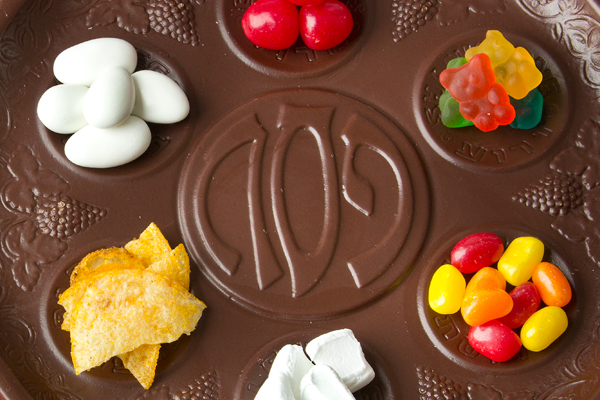 On the real Seder plate, folks put an egg, but for the fun candy Seder plate, we used the delicious Jordan Almonds – Made with premium California almonds, our Jordan Almonds Koufeta are candy coated with the finest candy shells. Karpas, the vegetable dipped into salt water at the Seder, got its own mash-up of the potato with the salt together in the crunchy potato chips we placed there. Charoset got itself a date, but we used a mix of Jelly Beans that resemble the colors and texture of the traditional Charoset. Kids and adults alike will love these Colorful Jelly Beans. Bursting with delicious fruity flavors which make it everyone’s favorite! 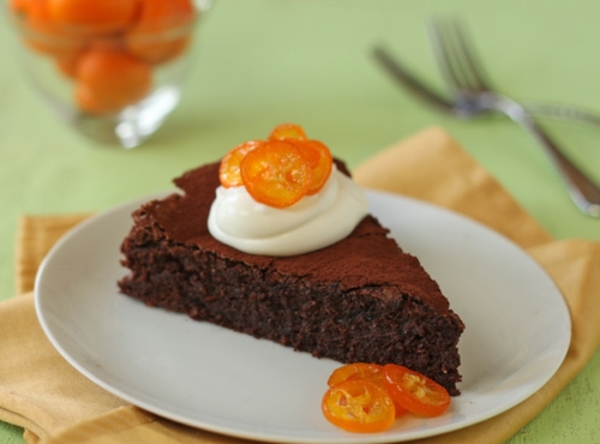 Feel free to add some real dates to your plate to add some natural sweetness ! Our Maror, ymbolizing the bitterness and harshness of the slavery which the Jews endured in Ancient Egypt, might not be bitter but it sure is very sour! Use any type of Sour Candies. Maror got covered with the sour candy. Its counterpart, the Chazeret, got itself represented with white marshmallow. Now if you are wondering why we spent so much time thinking up ways to make a Candy Seder Plate, it is to get across one of the main themes of the traditional Passover message. Teach your children. Keep the lessons of faith and of their rich heritage fun and engaging. Oh! Nuts, we wish you a “sweet” Passover and much Nachas from all the children around your Seder table.